Willow Creek Country Club was officially established in September 1964. The land that the course sits on today was once a farm. 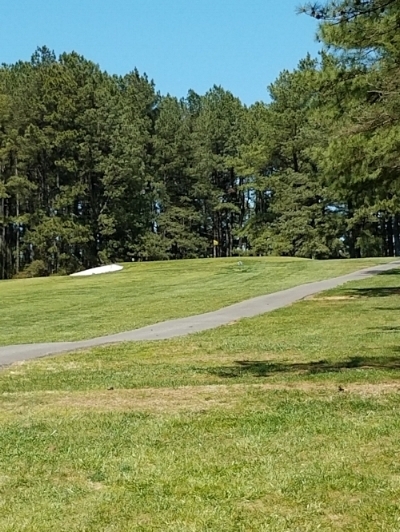 Now in its mature state, the course is lined with many tall pines and has a cozy feel on our 75 acres of property. The yardage ranges from 2,311 yards for junior players to 2,947 if playing from the tips. The course plays to a Par of 70. 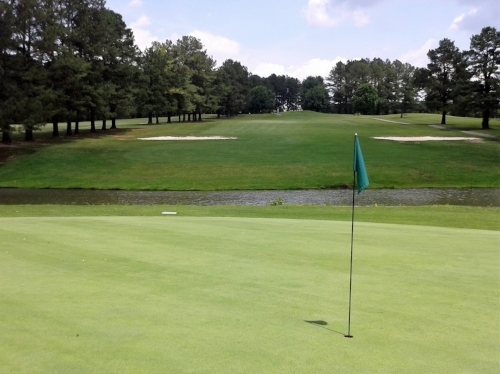 It offers three par 3's, a little bit of sand, water, and out of bounds on 5 of the 9 holes. Here is an overview of what to expect when you play this course. You make click on the photo for a larger view. Hole #1, par 4- Ranging from 320 to 375 yards, this hole has a good elevation drop to start, and a distinctive look from each tee box. An uphill 2nd shot to a small green, guarded by an ever present bunker on the left. Hole #2, par 4- The shortest par 4 on the course. Big hitters can take a shot at clearing the pond off the tee. The bunkers are strategically placed, making for a tough 80 yard shot over the water. Hole #3,par 4- You won’t see the flag from the tee box or maybe your second shot as well. Dogleg to the right. Precise shot needed to a fairway that is only 20 yards wide. Most players will have to play a blind shot over a menacing hill. Multiple looks on this hole. Hole #4, par 3- The smallest green on the course. Multiple tee areas allow this hole to range from 90 to 225 yards!! To add to things, out of bounds is to the right. 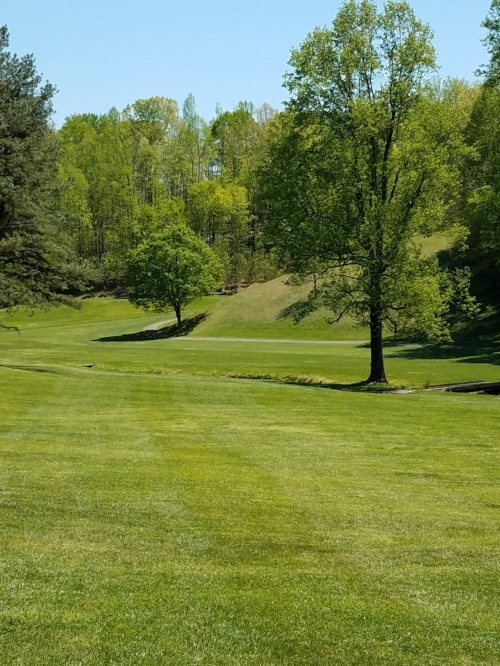 Hole #5, par 4- A wide fairway may help a little bit, and there is some risk or reward if you try to take a big swing at it. Next to the willow tree, in this photo, is a pond . The green is the largest on the course. The approach shot is all carry. Hole #6, par 3- A lengthy tee shot from the White and Blue tees, (175-185 yards). Ladies and Senior tees closer to 150 yards. Guarded on the right by a row of pines, and by 2 sand traps in front of green. Hole #7, par 5 - A short par 5 on the card, most times you will play this hole in 3 shots. This dogleg right fairway falls away to the left and a large bunker guards the green. Out of bounds runs the entire length of the right side of the fairway. Hole #8, par 3- This hole is at the highest point on the course, and most exposed to the elements, making club selection important. 2 small bunkers guard the green. 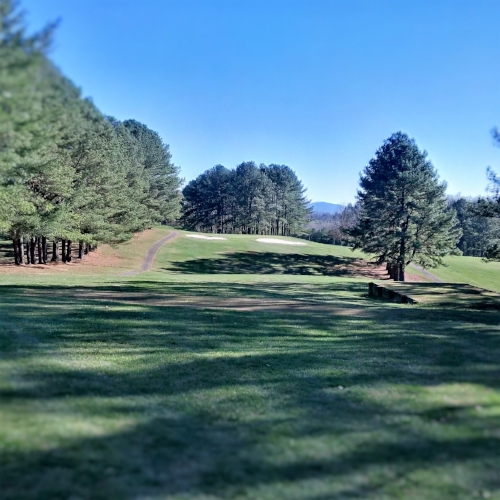 Hole #9, par 5- This 500 yard hole has out of bounds on right and patch of pines on the left you don’t want to get into. Two creeks intersect the fairway. Finally you must get to an elevated green.